The Ocoee River located in southeastern Tennessee in the Cherokee National Forest is the most popular whitewater destination in the country. White water rafting down the Ocoee River is an experience like no other with over 20 named rapids over 10 miles, creating a one of a kind experience. Like most hidden treasures, the Ocoee River is typically thought of as located in the middle of nowhere, with nothing outside of rafting to do. Well this is just not true. This article will highlight all the great things to see, experience, and taste in the Ocoee Area. Located in the area around the Upper Ocoee is a group of awesome mountain biking trails with something for all skill levels. Park at the Ocoee Whitewater Center (where the 1996 Olympic canoe and kayak events where held) and go into the welcome center for information on the trails and area. The Tanasi Trail System offers short and long runs as well as easy to difficult rides. Can’t bring your bike, then go checkout the guys at Cycle South (423) 548-1122 in Copperhill, TN. A moderate trail hike that takes you in to the Rock Creek Gorge Scenic Area. The Rock Creek trail is spotted with several waterfalls and creek crossings. At only 1.6 miles (each way) it makes for a easy half day hike. During the summer the upper section of the Ocoee River only releases on the weekends, so on the weekdays the area is spotted with little swimming holes. Up river of the Ocoee Whitewater Center is a trail that follows the river to a large swimming hole called Blue Hole. The water is crystal clear with rock croppings to jump off of and under water tunnels to swim through. The Toccoa River flows from Blue Ridge, GA to Copperhill, TN then turns into the Ocoee River. Like all mountain streams, trout are the game and fly fishing the choice method to catch them. The area from Horseshoe Bend Park in McCaysville, GA down is not fished as heavily as the rest of the river making it the perfect area to catch fish. 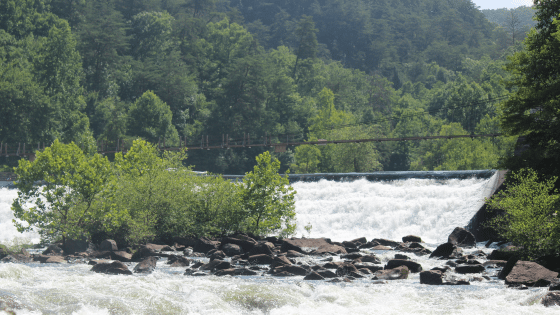 Want a guide to get the most out of fishing the Toccoa? Contact the guys at Blue Ridge Fly Fishing. Most likely this is why you are in the Ocoee River area, but are you going to get the most out of your trip. The full river trip is by far the best way to go, with 10 miles of white water and a riverside lunch in between. Sunday is typically a slower day allowing for a more personal trip. When ready to book your trip contact Carolina Ocoee. Located in Ducktown, TN this little sandwich shop is doing it right. Serving up awesome pizzas, hot and cold subs, paninis, and salads. All bread is baked each morning and everything is made to order. Copper Station is by far the most popular spot to eat with the guides at Carolina. For something special ask for the Carolina Special, it is a chicken florentine pizza with buffalo sauce and bacon added (not on the menu, you must ask for it). Located in Copperhill, El Rio serves up awesome Mexican food in a great atmosphere. When we are looking for a place to eat well and catch up on the world of sports, El Rio wins every time. As one of the only places that serves alcohol, it is the best place to wet your whistle. Nestled right outside of the Cherokee National Forest, Ocoee Nights is conveniently located to everything in the Ocoee River gorge. Locally owned by Olympic kayakers Joe Jacobi and Lisa Jacobi who live and play in the area. They have two rustic historical cabins with lots of charm, that have a real home away from home feel. A campground farm hybrid with lots of charm located a short drive from the river and trails. Camping near the Ocoee River is a great way to be fully immersed in the outdoor experience this area provides. Persimmon Creek Campground offers hook ups for RV’s as well as sites for tent campers. The owners put a lot into there property and it shows from the duck and fish filled pond to the on-site milled wood structures. If you are looking for a vacation home with awesome views and and all the modern convinces, these are the guys to go with. With lots of options in the Ocoee area, as well as the Blue Ridge area, they can help find the perfect fit for you. Mountain Escapes is headquartered in Ducktown, TN and takes a lot of pride in their local town and area activities. For more lodging options in the Ocoee River area check out our lodging page. We hope this will make your trip to the Ocoee more fruitful and show you why we love this area so much.